Traveling is not as exciting as people who don’t travel think it is. But if you are a traveler and you’re on planes as much as I am…you learn the tricks that save you time and aggravation. One of my tricks is to try and get together with people I know in the city I am traveling to…for a couple of reasons. It gives you something to look forward to when you visit a city where you otherwise would not know a soul. From a voiceover perspective, it also gives you insights and introductions to recording studios that are good to record at (as opposed to studios that are….not so much). I’ve been heading over to Charleston, WV and the surrounding areas for years now and fortunately sometime ago I connected with voice talent Amie Breedlove. She introduced me to Admix Broadcast Recording Studio owner and voice talent Charlie Cooper. We all became fast friends. So it was again this week that we all got together to solve the world’s voiceover problems. We handled some world problems too but those, as you can imagine, were pretty simple to solve compared to the complexities of script interpretation and microphone positioning. If you get a chance to work with either of these two fine, talented folks (where ever you are in the world) I hope you will do so…very worthwhile and very fun. 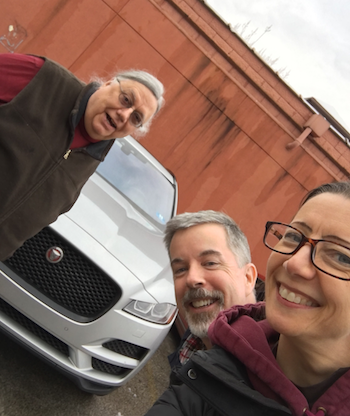 Plus Amie’s got a new Jaguar (see the picture)!!!! !